A family tracker and multi-purpose family helper. Not only is "My Family" is the most easy-to-use and accurate service where everyone in your family is and tracking their locations in real time, it’s an entire family service centre with a win range of functions. 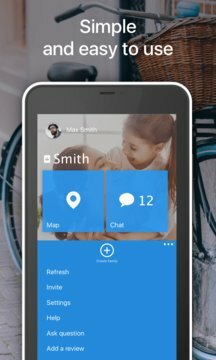 Locator My Family - is the most secure app! We have no registration and no reference to personal data. We do not store any chat history, nor information about locations. All data is stored only on the phones of our users. Our servers only transmit the "impersonal" information between users. You can be sure that nobody will be able to know where your child is or read your messages. 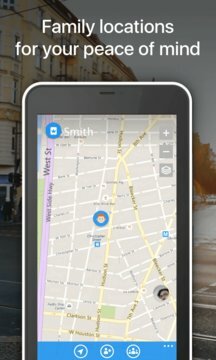 - DETERMINE THE LOCATIONS OF YOUR FAMILY MEMBERS IN REAL TIME. You decide on your own when your family can see where you are. - TURN ON KID MODE on your child’s phone. Your little wanderer won't be able to turn off location services or change the app's settings. - VIEW MOVEMENT HISTORIES for any of your family members on the map using the Tracking function. Movement histories are stored for three years! - CREATE PLACES and receive a notification when a family member arrives at or leaves a place. You will no longer have to worry about whether your child made it to school or your grandma to the cottage. - FULLY CUSTOMIZABLE! Select from 15 colour themes! - HAVE A FAMILY CHAT. Your family will always be there to talk. - ASK YOUR "FAMILY MENTOR" FOR ADVICE. A family counsellor of sort that will give you advice based on your family’s behaviour. Why should you download "My Family"? - My Family lets you ensure your children and elderly parents are safe and secure. Say good-bye to unjustified worry. - You decide for yourself when your family can see your location. We can always make your location invisible in the App's settings, but not in Kid Mode! - Your children will be less scared to leave the neighbourhood and venture out into the city. - View any family member's movement history for the past three years! Please note that all features based on GPS technology require a GPS-equipped smartphone and require GPS to be turned on in your phone settings. Of course My Family can find where you are using your cellular signal alone but the GPS offers exact coordinates. The App conserves power, but as with any app with GPS functionality, your battery life may be slightly diminished.